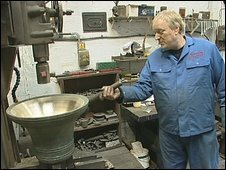 A Leicestershire bell foundry that cast the largest bell in the UK has been saved from closure, saving 11 jobs. Taylors, Eayre and Smith, which created the Great Paul at St Paul's Cathedral in London went into administration last month due to a falling order book. Adminstrators said the firm, in Freehold Street, Loughborough, has been sold to UK Bell Foundries Limited for an undisclosed sum. It created Great Paul in 1881 and can trace its history back to the 14th Century. Simon Chandler, of accountancy firm Mazars, said: "We are absolutely delighted that such a specialist manufacturing business has been bought as a going concern - especially in the current climate - and that the tradition of bell founding in Loughborough can continue."